Internal removable tray to catch cigarette butts - easy to clean. Cigarette Bins Direct offers a range of products which allow cigarette and cigar smokers to dispose of their ash and cigarette butts simply and effectively. As the UK’s leading independent manufacturer and distributor of stainless steel cigarette bin and wall mounted ashtrays, Cigarette Bins Direct is proud to offer a range of contemporary designs which are suitable for any external area, be it an office building, pub patio or smoking shelter. Cigarette Bins Direct products are manufactured from high quality stainless steel, in brushed (satin) and polished finishes. 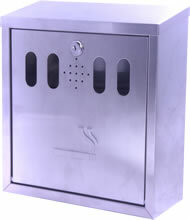 With secret fixings and secure locks, our range of wall mounted ashtrays and cigarette bins offer anti-theft qualities far superior to others found on the market. The secure locking mechanisms allow for easy cleaning and removal of cigarette / cigar butts and ash. Internal ashtrays are provided with the box shaped bins, whilst the cylindrical bins have hinged bottoms which allow for easy emptying. 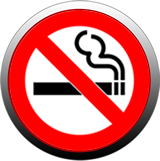 Cigarette Bins Direct also offer a wide range of no smoking signs from small discreet self adhesive stickers to large aluminium signs. We even offer tactile and Braille no smoking signs.